11/19/2013-The FUBAR 2013 is about to end, the final leg from Muertos (23.59 N x 109. 49.3 W) to La Paz (24.13.07 N x 110.18.47 W) is only about 43 miles. We have traveled 900+ miles as a group. Almost all of us will make our way to La Paz and meet the wise ones who left a day early from Los Cabos. A few boats are heading direct to Mazatlan or Puerto Vallarta. With only 40 miles left in the journey pulling out this morning is bittersweet. It was great to travel as a group, the feeling of security and common goal provided much needed support for traveling in foreign waters, often miles from shore at night and into new harbors. On the other hand, many of the typical decisions that go with cruising were made for us. Weather reports, dock assignments, anchoring locations and when to move and when to stay were all provided or at least strongly supported by a group decision. This masks the true responsibility and to some extend the feeling of accomplishment cruising a small boat offers. We left Muertos this morning at sunup, just after 6 AM with a forecast of much of the same from yesterday. Winds would be in 15- 20 kts range, mostly on the nose. Seas would be short and choppy, augmented by currents as we passed thru the Cerralvo Channel, separating Isla Cerralvo from the Baja peninsula. This 27 mile long channel funnels wind and seas and can reach currents of 2 kts or more. Today was surprisingly calm with wind in the low teens and fairly flat seas. Kept waiting for a repeat of yesterday but the faster boats reported improving seas most of the morning. When we reached San Lorenzo Channel, a narrow pass between Isla Espiritu Santo and La Paz we were greeted with even better weather for the final miles. This pass is about 3.5 miles wide but rocks narrow the safe passage to only 1.4 miles. Its well marked and we followed the fleet around the corner and turned from NW to W and finally almost due south as we approached the well protected harbor of La Paz. 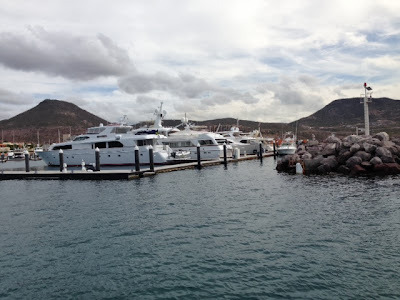 On the final leg of the trip we began to see the reason La Paz is a favorite of cruisers, both power and sail. 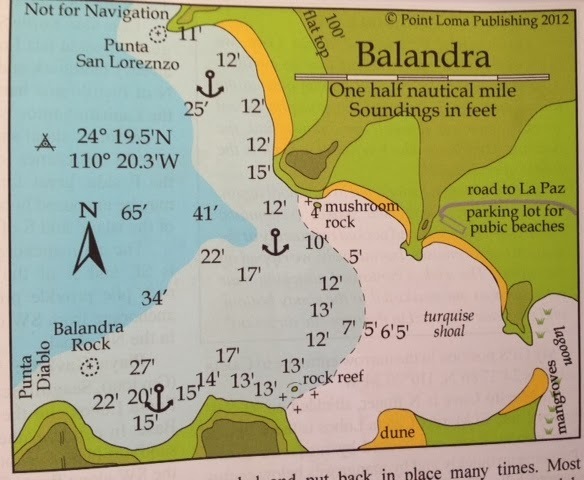 We passed half a dozen picture perfect anchorages, most with sheltered coves and all with a sand beach. Only a few sail boats were seen and the experienced travelers say these locations are “just the beginning” of the Sea of Cortez. We approached Costa Baja marina around 2 PM in mild breezes, mid 80’s F and 1-2 ft chop. Got a slip assignment in the back basin, while the larger FUBAR boats made their way to the front basin reserved for larger boats. Up until now the Nordhavn 76 (Spring Day) has been the queen of the fleet. She is now nestled in a slip facing some yachts in the 100+ ft range. One has a helicopter tucked nicely on deck and about a 32 footer as a tender next to it. Once again proving that no matter what you have there is always going to be a bigger, faster, prettier etc boat (substitute any object of desire here) in the harbor. A lesson often overlooked by me but I’m committed to learning it in this chapter of my life. Safely tied to the dock in one of the best hurricane holes in the Sea of Cortez, the journey is finally over with the FUBAR 2013. The marina is hosting a dinner tomorrow to celebrate the trip and no doubt encourage us to stay longer. Costa Baja is a major development, very upscale and boasts top tier restaurants, hotels, golf course and condominiums. www.costabajaresort.com Located too far from the town of La Paz to walk (4 miles) they have a shuttle every few hours to the main part of town. This table is based on Flow Scan readings taken in Ensenada and the end of the trip. We ran slightly faster to stay with the fleet than we normally cruise given the total engine time includes warm up, harbor entrances etc. Fuel per hour was also above our 4.5 gal/hr goal but we also enjoyed favorable currents. Our return trip will buck this favorable current and add to both the time and fuel needed to return. It’s know as the “Baja Bash” as it is also against the prevailing wind almost the entire trip up the coast of the Baja Peninsula. Before we have to face that we have many more miles to cover in the Sea of Cortez and dozens of nights on the hook in some of the best cruising waters in the Pacific. Dave, Lori and most importantly Mary were great support for this journey. Each played a key role in a safe passage. All except Keela took watches in the wee hours, slept in a moving vessel never more than 50 feet from each other, ate with one hand holding onto the plate and generally took responsibility for not only themselves but the entire crew. Everyone stayed healthy, likely gained a little weight and met a wide variety of like-minded people all living their own dreams. For me this is the beginning of a 10+ year quest to cruise under power. It all started 15 years ago with a book called “Honey, Let’s Buy A Boat”. Things really got going when the book “Crossing An Ocean Under Power” was published based on the Nordhavn Atlantic Rally. We all owe a great deal to the real pioneer of power cruising, Robert Bebe. He was one of the first to execute the idea of cruising under power rather than sail. Mary has thrived and at times endured living on a boat since 2002. A very different lifestyle than living in Scottsdale Arizona where we met. We started on a 42’ Grand Banks, spartan by the standards of the current WORKNOT, in San Francisco Bay. Every experience gained along the way has improved our skill set to make this trip. From picking the right boat to selecting the gear onboard, it all matters. Equally important is the ability to rely on each other and enjoy the close quarters, endure discomfort and occasionally fear while staying committed to our “dream”. A few quiet sunsets and a peaceful cruise and all the hard stuff is quickly forgotten. Without the commitment, hard work and love of Mary this journey would not have been possible. We are now positioned to live our dream and will keep you posted. Here is a sample of the next few months and yes that is a UK flag flying from the bow!